A pair of great surprises turned up on a cycling trip I took through the southwest a few years back with a friend from Dublin. First came a stretch of seven straight days of sunshine, a near-miracle in Ireland. The second was our discovery of a hidden gem called Cape Clear Island, one of the most serene destinations I've ever found. We cycled the 40 miles from Cork City to Baltimore, where we carried our bikes on board the ferry out to Cape Clear Island (on many maps it's listed as "Clear Island," but locals all call it "Cape Clear Island"). Crossing over took about an hour. After disembarking, we soon discovered that the entire island seemed to go uphill. Slowly walking our bikes along, we asked a young Irish woman where the B and B was located. 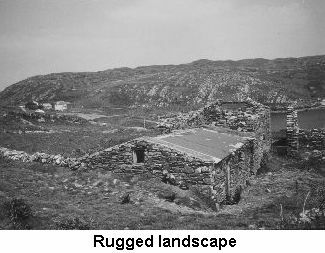 She had no idea what we were saying, and responded to us in Irish - a surprise given that most of the Irish-speaking areas or "Gaeltachts" lie in the northwestern parts of the country. We eventually found a small local shop that sold a few necessities - it was clear that locals took the ferry to get most of their supplies. The shop was only open a few hours each day. After a kind soul of a man directed us to the B and B, and we found ourselves before a lovely white Irish country cottage with a chicken house made of stone, both facing due west towards the sea. We knocked at the door and the lady of the house greeted us warmly, wearing a fancy dress hat that seemed a bit out of place. After a hurried round of welcomes, she apologized for the fact that she was leaving for a whole week to attend her niece's wedding in Dublin. "Make yourselves at home," she said, before toddling off down the lane to catch the ferry. We never saw her again. Her older children came out to welcome us, and we all soon turned into a little family (I even prepared a meal for the whole clan one day). I stayed in the "box room" (what the Irish call the smallest room in the house), which was warm and cozy, with a down duvet. Each night I was lulled to sleep by the sea and howling winds. By day, we explored the island on our bicycles, always seeming to be traveling uphill. We discovered several stone ruins, farms, a few churches, and a windmill that generated electricity to most of the island. We were treated endlessly to lovely views of the sea. Whenever I'm asked about my favorite sunset, I always reply hands down, "Oh, on Cape Clear Island." One evening, we hiked to the top of a cliff which overlooked the sea in every direction...north, south, east, and west. The brilliance of colors which marked the sky were breathtaking as the music of the waves sang beneath us. 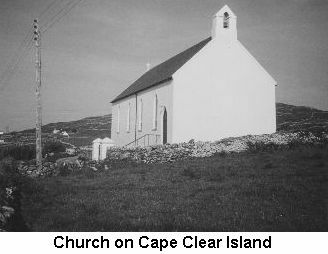 I left Cape Clear Island very rested, with a pocket full of sweet memories, and aware again of the joys of living a simple life. I recommend it as a great getaway spot if you don't mind climbing hills and walking or cycling wherever you might want to go. It's just a short step off the road travelled by many tourists in the southwest, but it feels like a world apart. Julee Glaub is a musician.